Is there a way to locate my previously asked and answered questions here on the forum to refer to them? It's showing up blank when I click the link...is there another way to get to it? Thanks! I have searched my name and still don't see the particular thread that i'm looking for. is it possible that there is another way besides the forum here to ask a question and that is what i'm remembering? Does this not happen on your end? Oh sorry, I misunderstood you. The thread for which you're searching may be private. Such threads are not displayed in search results. If a reply was made to a question asked in the said thread, you would have received a notification. 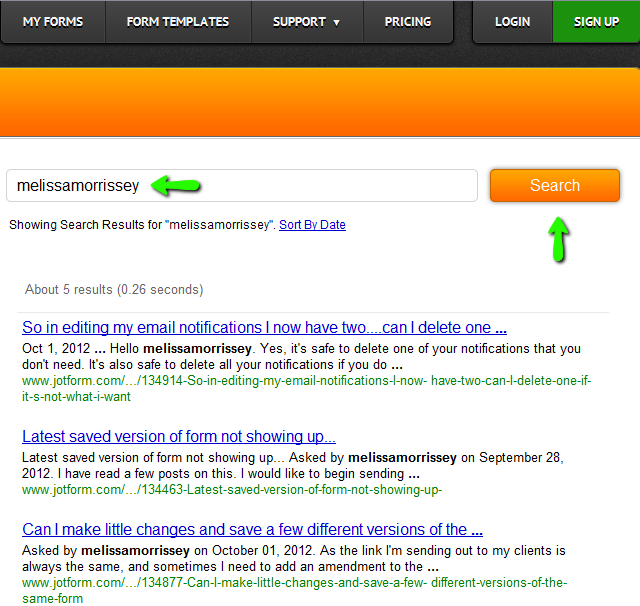 Please search your email records for all messages from jotform@jotform.com and let us know if you find it that way. Oh right, that might work, thank you! Nope, that does not work! It was a very detailed screen shot explanation of how to customize the email notification fields! I was trying to avoid asking the question again...are private messages between me an staff not saved somewhere in my acct on here? Can you recall which member(s) of our support team dealt with it? No, I can not. It's bugging me. I guess I will just have to re-ask the question. Have you tried search your emails for it? There should be a link back to the forum thread if you can find it. Feel free to post the question again if you dont think you will be able to retrieve it. If the link can't be found perhaps it would be best to just pose the question again. It really wouldn't be a problem for us to answer it again.